So, a couple of weeks ago, I was actually in South Africa visiting with my wife and some of her family (they’re all Afrikaners). We were all super-busy and touristy out there, but I did have one day dedicated to toy shopping (thanks Monty and Alec). I hit up a bunch of antique shops and toy stores. I didn’t find much, but here’s a little something I definitely want to show you. I’ve seen this guy here and there at flea markets over the years, but according to the shop owner I bought this from, this one is from the 40s. I think I believe her. It does look like a vintage/antique Weepy. He has a better color scheme and paint job than the more modern reproductions. 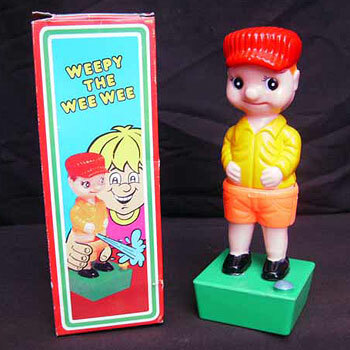 It appears that Weepy just gets re-released with new packaging and new color schemes every once in a while. For those unfamiliar with Weepy, he’s basically a cute little kid with an innocent (yet sly) look on his face. Looks like he’s hiding something. I never thought I’d own a urinating toy. Yep. Simply fill Weepy’s base/reservoir with water, pull down his shorts, and voila – the cutest, little urine stream you’ve ever seen in a toy. 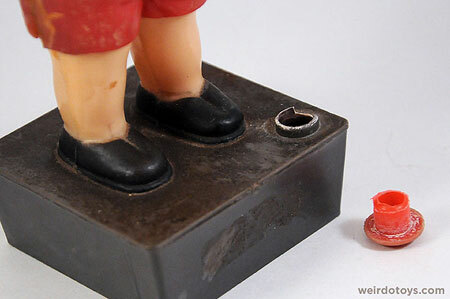 As you might have noticed, this toy is pretty old and kinda cruddy. He has stains and aged glue where some previous owner has made lame repair attempts. His pee action still works, but it’s a bit weak (I hear that happens with age). 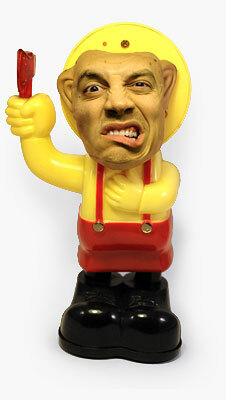 While searching for info for Weepy, I came across a really disturbing version of him. This Weepy definitely doesn’t have the charm of the original Weepy. He’s got his hands in his pockets, and he’s wearing shorts over his pants. Weird. @smack6102 Wow. I’ll have to keep an eye out for that. @smack6102 Ha! That’s great! Thanks. I’m not taking the piss, that was one great stream of consciousness post there! Urine luck if you read it, and if you don’t you’re flushed! I bet the readers are trickling in as we speak. They’d be dicks not to, because this toy is a wiener! You really now how to let the puns flow. Thanks for dripping by. Funny I was just given one of these older ones in the original box. Great fun, my 24 year old son never saw it coming till it was dripping off his beard. LOL! Thanks. I was hoping to find weirdo African toys, but no such luck. HA! That video is so BAD!! (in a good way) Good ol’ Weepy. I actually found one of the red/orange/yellow versions at a flea market long long ago. Your older, more mature weepy is much cooler. Great color scheme too. Next you’ll have to find that other freakier pee kid and have a little pee-off between him and Weepy. The pee-off idea creeps me out. 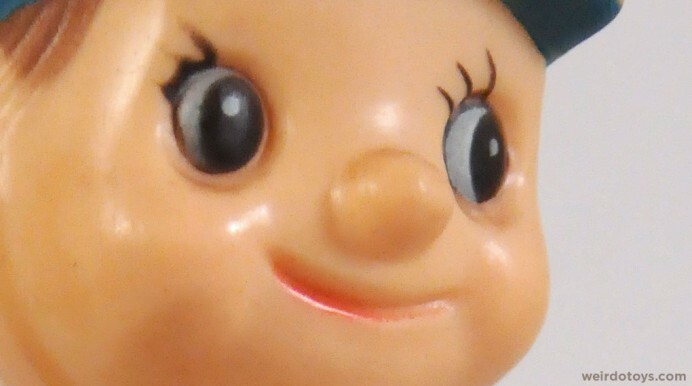 The video footage of Weepy actually had a more powerful stream in the original video. Seems like YouTube dropped the millisecond of pee stream. 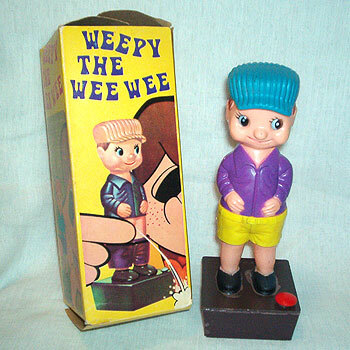 I will attest to the difficulty in finding an original Weepy Wee Wee. I mean, it’s not like I’ve ever tried looking for one before, but I seem to come across the reproductions all the time. My parents have a REALLY old German set of figurines where two children are taking a leak into a bowl. I attempted to Google this to find a picture online and was really, really disturbed by the results. Guess we know what kind of people will be inevitably stumbling upon this entry! Ha! Yeah. I don’t even wanna go near those search results. 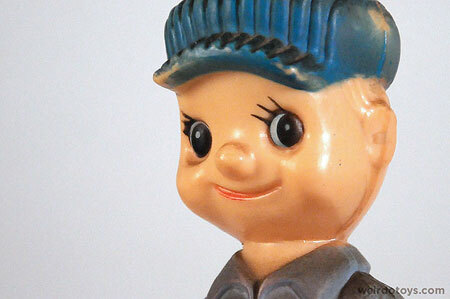 Some folks on Twitter have informed me that those type of toys were common in home bars. They were used for mixing whiskey and water. Interesting. When I was a kid, really young, probably 6 or 7, we were on a family trip and stopped at a big roadside gas station. Inside, on the checkout counter, they had one of these Wee-Wee knockoff toys. I was intrigued, and activated it (I want to say it had a push button, I don’t remember for certain–maybe like the one on the last pic, you pushed down on the hat or something) and to my utter surprise, it took a whiz all over the counter top. The lady behind the counter shrieks, “DON’T TOUCH THAT IT’S NOT FOR KIDS!” and snatches it off the counter. I guess the lady didn’t want you to break her prized urinating toy. Or she didn’t want your parents to report her perversions to the authorities. @WeirdoToys My coworker has one of these in his office. Takes you by surprise the first time lol. @LouisianaJeff Ha. Good to know. I don’t think the Weepy at the bottom is wearing shorts over his pants but rather shorts with hiking socks. Frank, I believe that is a British schoolboy in his uniform with shorts and grey kneesocks. I’ve been cracking up at your Weepy the Wee-Wee post! 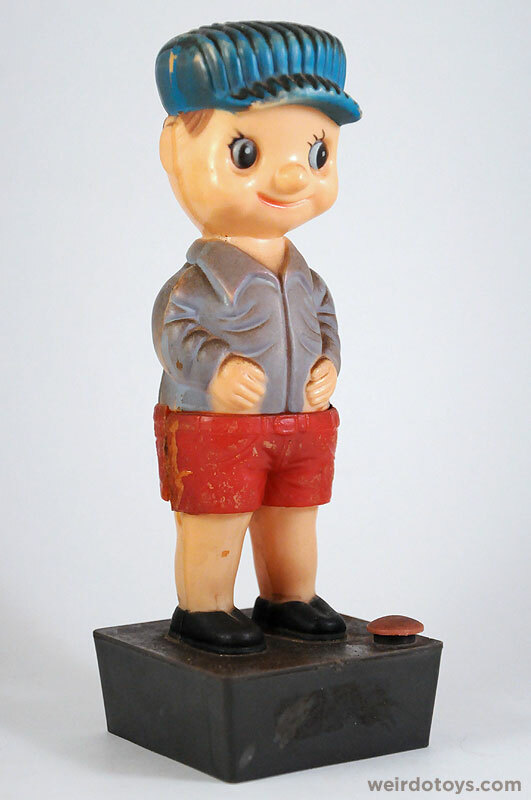 My Nan had one of these on her fire place for years. It was a different colour & was even more battered but I remember finding him bloody hilarious as a sprog. I used to make him piss on my cousin..ha,ha!! Good ol’ days!! The vid was comic genius!! 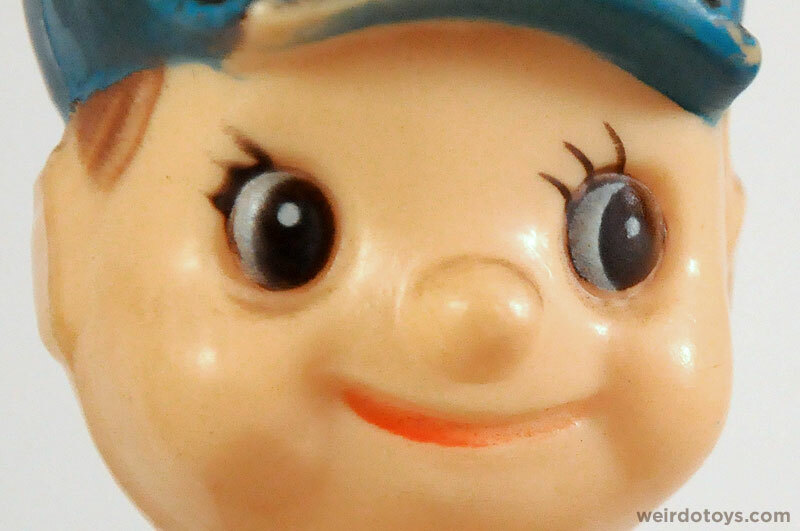 thit toy looks a lot like my cousin carson. and it also reminds me of that time that he peed on the floor! 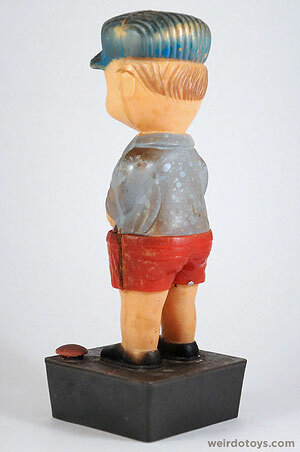 My Uncle gave us a plastic figurine of a man that peed when you pushed a button locate on the back of the figure. We were little kids at the time, and I guess he thought it was an appropriate toy! I remember it as a man in a kilt, my sister says it was a monk. (This was a long time ago, so it’s hard to recall). Anyhow, his kilt or habit would open at the press of the button, and he would pee. I think it was meant for behind the bar, that’s where my Uncle kept it anyhow. My parents got rid of it right away, and I never saw it again, but we thought it was hilarious! Every once in a while, I try to find a picture of it on the web, or information, with no luck. Anyone else ever see one of these? There was an article posted today about a gas station attendant who was fired because he used this toy to spray windshield cleaner on a customers windshield and then cleaned the customers windshield. Apparently the customer thought it was inappropriate to use this toy. It is a bit upsetting because this attendant goes out of his way each and every day to make the best of his job and to brighten people’s day. He dresses up, wears a bowtie and even delivers your card and receipt on a silver or gold platter. He is extremely nice and every time I have had him attend on me I have always left smiling. I understand that it may not be the best choice however, out of the hundreds of people he serves each day he works he has never had a complaint against him. I truly feel bad for him because I know he didn’t do it to purposely make that customer feel uncomfortable. I am sure he used the toy thinking he would make someone smile and maybe have a good start to their day. I just wish more people were like him and less people who get offended by silly jokes.